AirJet’s snap-lock design is deceptively simple. It is so easy to use in fact, that many first time installers attempt to over-complicate it. Here we describe both assembly and disassembly of AirJet pipe and provide troubleshooting instructions. With the second piece in hand, align the seams. Apply force straight down until you hear the snap (click) that denotes lock engagement. Apply force straight in until you hear the snap (click) that denotes lock engagement. Place the adjoined section on the floor. Use your feet to firmly hold the bottom piece. Obtain the help of an assistant. Have assistant hold one piece firmly. Pull straight out on the other piece to fully engage the snap locks. On the other piece, twist counterclockwise while pulling out. 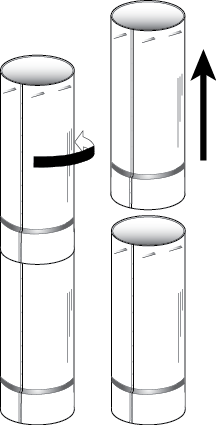 If the product does not assemble as easily as depicted here, it has likely come out of round or become otherwise damaged in shipment. Inspect both the male and female ends of each section you are trying to connect. The male end should be smooth and round. An oblong shape denotes that it has been crushed in transit. For minor damage you may be able to apply force in the right locations to correct. Otherwise, report the damage to the shipping company. 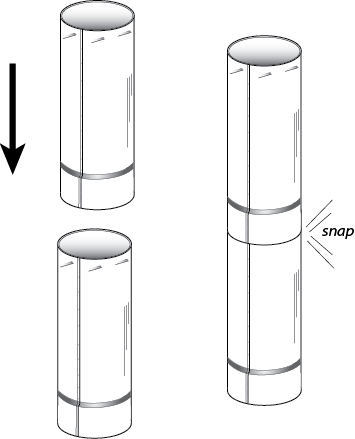 The rolled edge, a common feature of all AirJet pipe, should have a consistent thickness. A rare manufacturing defect can account for an uneven rolled edge. On the female end, look for the same oblong shape problem. Also, check the inner wall, where applicable. It may have become pushed up against the outer wall or have other damage such as a bent seam.